This frame plays with chromatic contrasts and futuristic geometric shapes, while mixing artisanal research and an unconventional design. Available in Black/Havana, Green/Blue and Bordeaux/Havana. 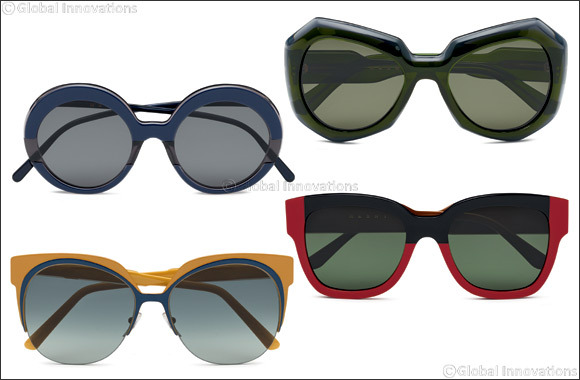 The perfection of a circle in a pair of glasses characterized by a soft, rounded silhouette and balanced hues. The color scheme includes Green/Blue, Blue/Grey, Bordeaux/Havana. The round lenses are inserted on a squared brow line, unique with precious contrasting details and creating an interesting shape. Unusual color palette: Green/Rose Gold, Blue/Brown, Red/Plum and Ochre/Blue. Juxtaposition of bold colors and classic hues are perfectly in balance between avant-garde spirit and tradition. The sophisticated color scheme includes Black/Red, Black/Ice, Green/ Havana and Azure/Havana.